The Megalodon or Carcharodon megalodon was a prehistoric shark that could grow to over 50' in length! Some people still think that these massive sharks are still roaming our oceans somewhere, but the facts of the matter suggest that they actually became extinct around 1.5 million years ago. Its massive size makes it the largest known carnivorous fish in the world! Also known as the Mega Tooth Shark or Giant White Shark, the Megalodon was though to feed on large marine animals of its time. Scientist even think that they fed on giant whales, dolphins and anything else they can sink their teeth into. 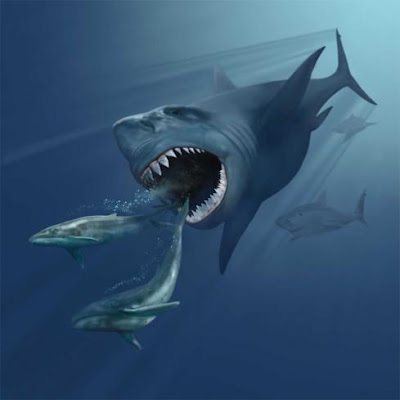 Megalodon were ambush predator that would normally wound its prey with a devastating first strike and then circle it until it weakens enough to devour. As you can imagine from its amazing size, it had a ferocious appetite. Like all other sharks the skeleton of the Megalodon is made of cartilage instead of bone which makes it even harder to find the remains of this ancient creature. This shark's unbelievably large serrated teeth measure more than 18cm! They are similar to those of the Great White Shark, but absolutely dwarf them in size.